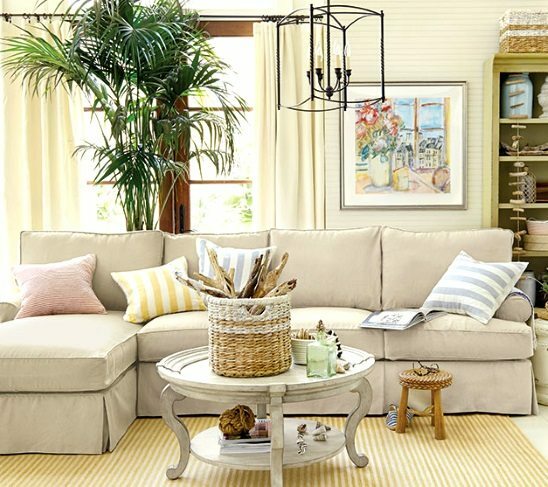 Rattan, grasses and bamboo lend a great beach vibe to the home. 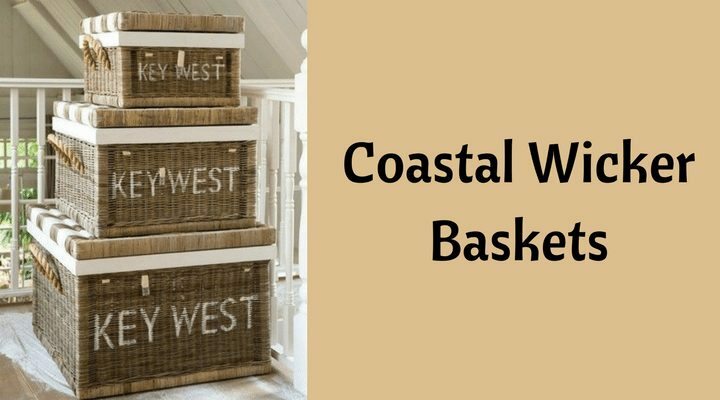 No matter what type of natural materials are used to create wicker baskets, they’re awesome for decorative storage, and so versatile with many styles to choose from. Target has a nice selection of wicker baskets, so has World Market, West Elm, Pottery Barn and Serena & Lily (links will drop you right into their basket department). And check out One Kings Lane for sale items too. Entry storage nook seen at HGTV. 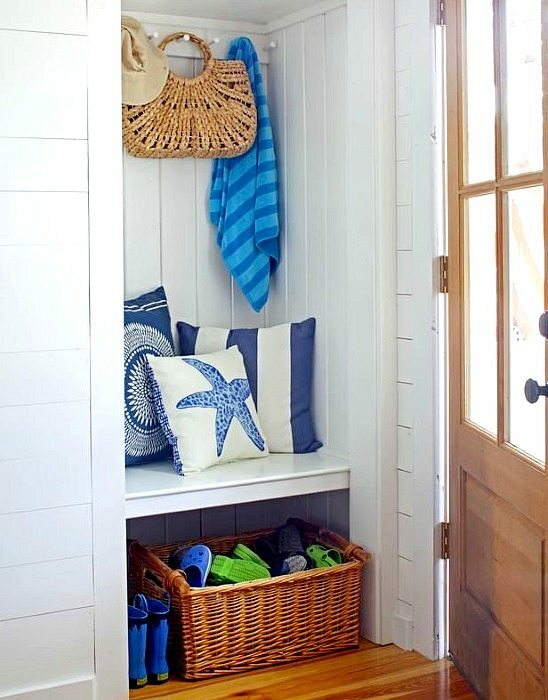 The wicker baskets on the wall are from Kohl’s via Aimee Weaver, and the entryway with the cute blue basket is by designer Tracey Rapisardi. I’m pretty sure the basket is custom painted to match the rest of the decor. 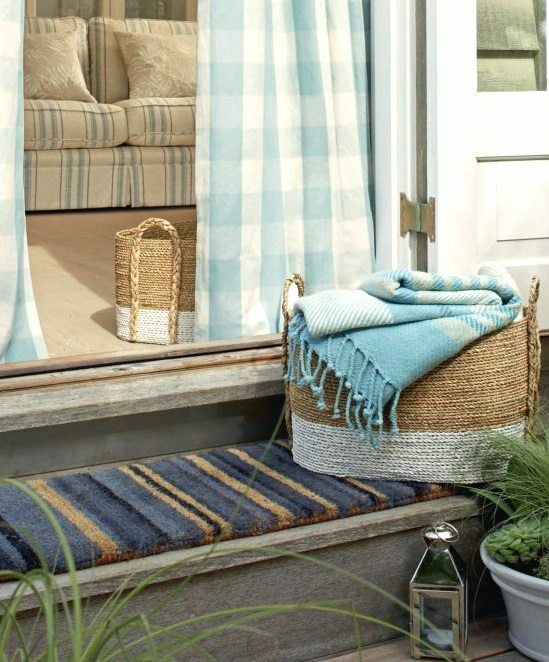 To create the look, check out Kohl’s set of Blue Wicker Baskets. I’m liking the shopping style basket idea with handles. 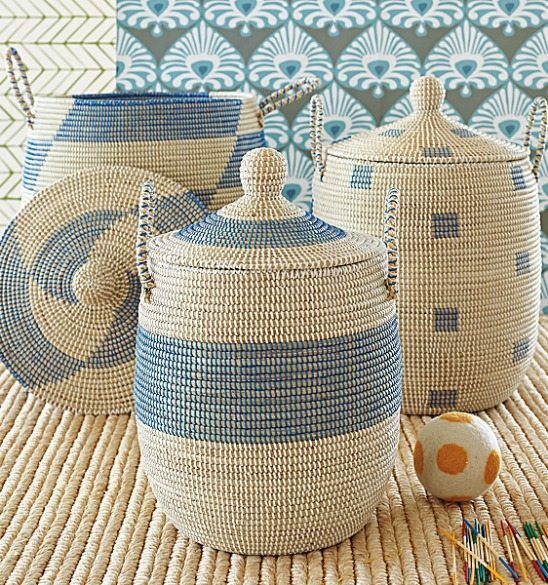 You can find some cool ones at Fair Trade Gifts & Home Decor, and West Elm has pretty “bag” basket also. 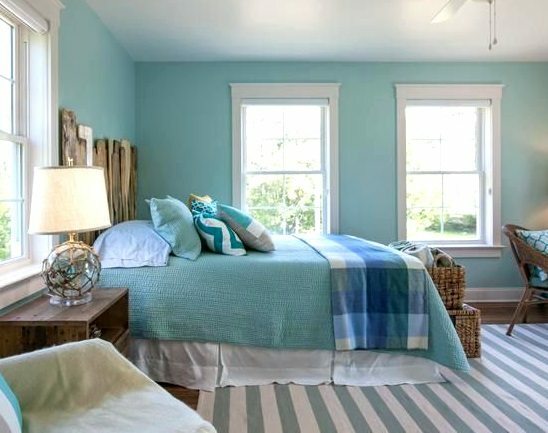 To see the rest of this adorable beach cottage, head here. Hide your stuff away! 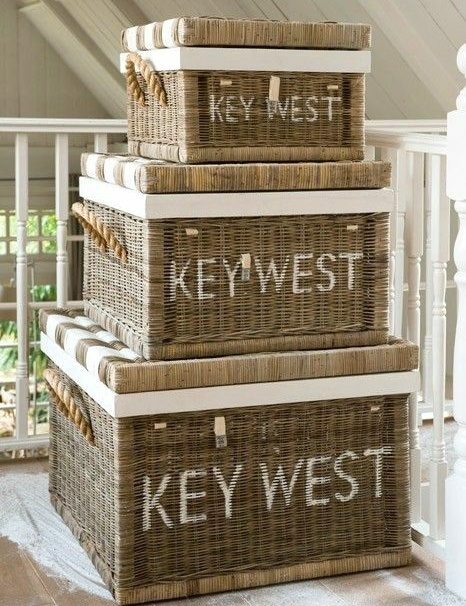 Stack up the Lidded Baskets from Pottery Barn, available in three different sizes. 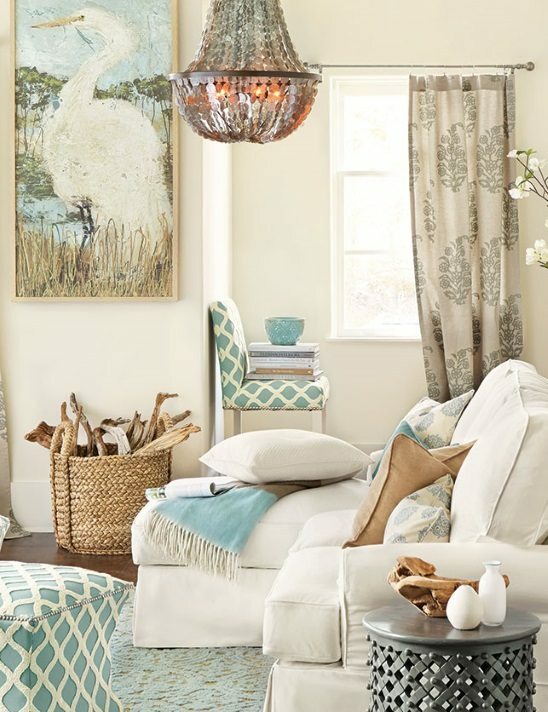 Update: Or get Pottery Barn’s cute Adorned Woven Baskets. New for Spring 2015! 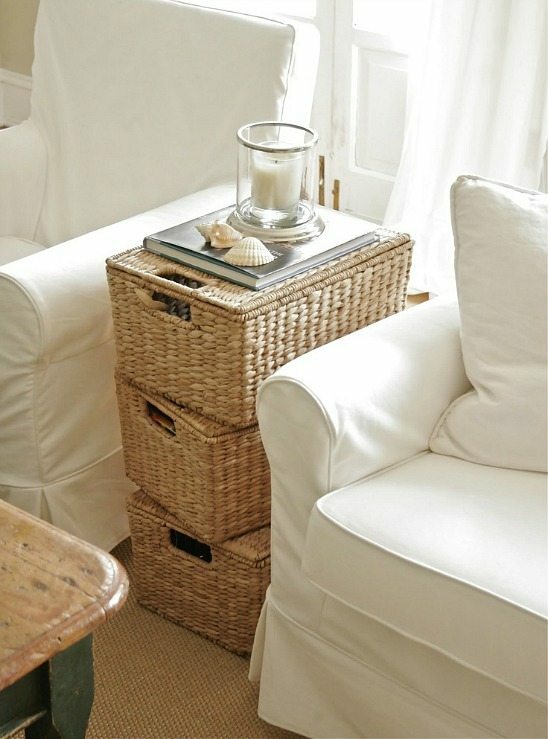 Simple Utility Baskets for under the coffee table storage. A cottage makeover featured here. A Long Narrow Basket can go under a coffee table shelf. 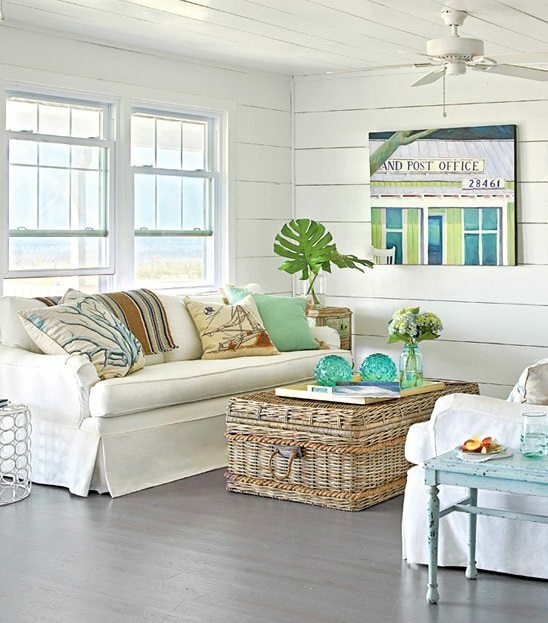 This beachy living room is featured here. I’ve always loved the look of woven storage coffee tables. I guess this is more of a trunk than a basket though. 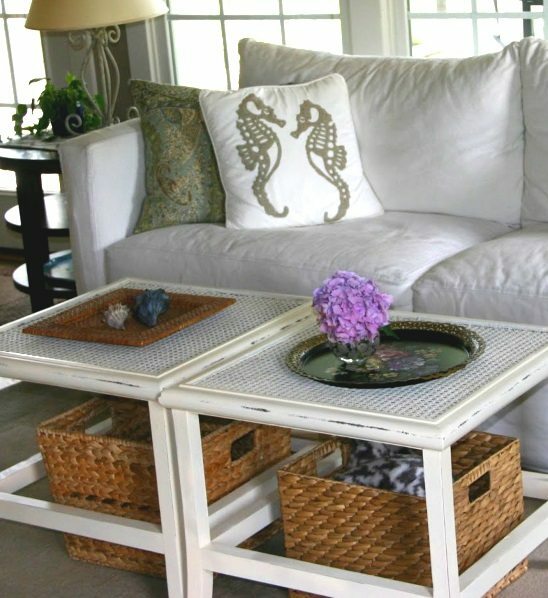 Sanibel Trunk Coffee table available at Soft Surroundings. You can tour this home at Completely Coastal. Ticking baskets from Ballard. A place for your Driftwood collection! Great chunky round baskets, sold by Ballard and Pottery Barn, also referred to as sweater-weave baskets. Here the chunky wicker baskets are used at the foot of the bed to hold pillows and throws. If you prefer chunky square, take a look at Horchow’s Woven Baskets. Bedroom is featured at HGTV. For an awesome selection of beachy bedding, click here. 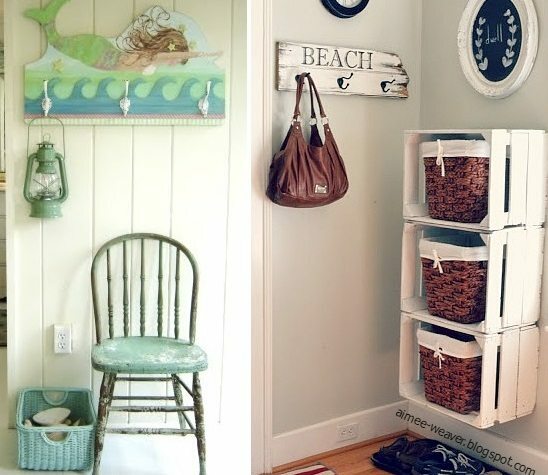 For even more storage in the bedroom, stack large baskets. For the bottom, choose a Lidded Basket. You can see more of this bedroom here. Another chunky basket. 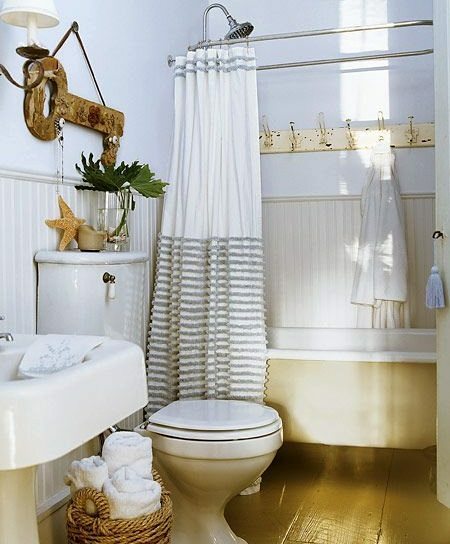 Great way to casually store towels in the bathroom. Blue Storage Baskets from Serena & Lily’s Selection. These are woven from seagrass and strips of recycled plastic. 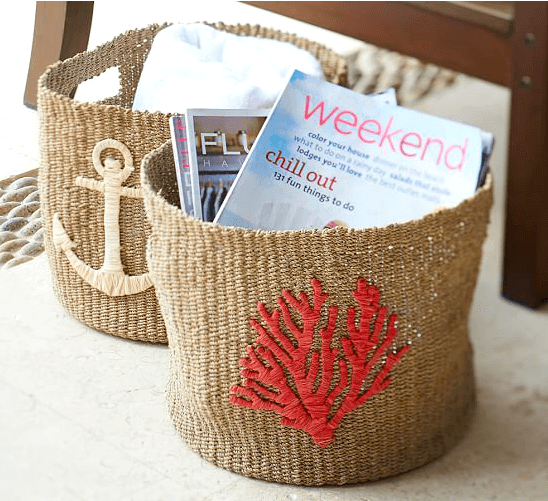 And here’s a great idea -stencil your favorite Beach Destination on wicker baskets! Featured on Completely Coastal. Also fun, and definitely works with the beach theme, dip dye baskets. Seen at Laura Ashley UK, but not available in their US online store. So you have to DIY Dip a Basket! It’s hard not to fall in love with wicker baskets. They more than just complement the beach theme, they enhance it!